Camfil’s ‘Clean Air Roadshow’ is coming back to London to raise awareness of the health effects of air pollution. Camfil is bringing their Clean Air Roadshow back to London in June to highlight the issues surrounding air pollution and the links between outdoor and indoor air quality. Camfil is a world leader in the development and production of air filters and clean air solutions and has been the leading sponsor of ‘Clean Air in London’ since 2011. Camfil’s Clean Air Roadshow will be at the Facilities Show at the ExCeL London on 21-23rd June 2016 on Stand U1500. You must register below to attend. Simon Birkett, Founder and Director of Clean Air in London, will be delivering the Closing Keynote Speech at the ‘Facilities 2020 Strategy Summit’ for the three day event between 2.30 pm and 3.00 pm on Thursday 23 June. It’s titled ‘One Atmosphere’ – getting clean air in cities. Please register for the event via the link below and come along. The Camfil team will be on hand to demonstrate to Property and Estates Managers, Facilities Managers and Health and Safety professionals how their award winning low energy heating ventilation and air conditioning (HVAC) air filters can save lives and money. Camfil will be demonstrating their patented air cleaners and air purifiers which are equipped with the most efficient Absolute™ HEPA filter. The units complement existing ventilation systems to provide a healthier working environment with less dust and fewer harmful particles. 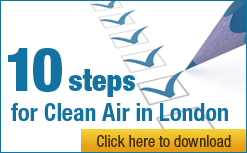 live Roadshow Measurements – showing how air quality varies daily and by location. Camfil have placed three air quality monitoring stations in different city locations around the world that continuously report real-time air quality back to the trailer. These values will be compared to local conditions, inside and outside the trailer. Download the presentation here – ‘In and Out’ (posted at 530pm on 23 June 2016). If you can’t wait, then you can take a look now at http://www.camfil.com/roadshow/virtualtour/. To attend Simon Birkett’s keynote speech or a session in Camfil’s ‘Clean Air Roadshow’ please register for the event. If you want to know more about air filters, or need any help, please contact Camfil directly.